At this stage you select the materials, colors, and finishings that bring the interior of your home to life. An interior designer is very involved at this stage to assure the interior your home is beautiful with the look and feel you envision. All your selections are used to provide you with accurate pricing, and the addition of these details truly makes a home uniquely your own. 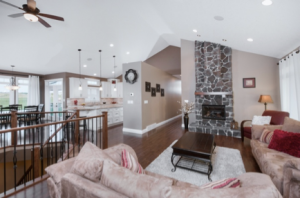 An interior design professional can also assist you with the design of a functional floor plan and their attention to detail, finishings, and color selection will help you create truly unique and beautiful spaces within your home. Involve your spouse or partner in this process and address their preferences. Also involve your builder, to keep your budget in mind. At this stage the builder combines the detailed plans with all of your decisions to prepare a final budget. The builder will complete all the documents required by the lender and local authorities. If required for the loan, the builder will write-up the specifications of the land and building plans, and the lender will do an appraisal. If required by the lender, the builder produces documentation showing the home is enrolled in any necessary warranty programs. The builder will negotiate a mutually agreed-upon price for the construction of your home and present you with a construction contract. There are two main forms of contracts, fixed price and cost plus. A fixed price contract includes all agreed upon work at a set cost. If there are any changes, a change order must be completed and any additional costs are paid. The benefit of this type of contract is you will know the exact cost of your home and can plan accordingly. A cost plus contract includes you paying for all the labor and material costs plus a percentage or fixed fee for the management of your project. This type of contract gives you more flexibility to make any desired changes, and allows you to supply some of the materials or labor yourself. Once you decide which type of contract you prefer, the builder applies for the necessary building permits and approval from local authorities so construction can begin.